We've just brought this fellow into our breeding program. A few weeks ago, we bought two of his female crias, and when we got them home and realized how spectacular they were, we went back for Carlton. In fact, we're making a third trip to buy another of his daughters! He produces both incredible lock and a phenomenal degree of luster, and will be perfect to use on all of our original line of females. With both Jackpot and Uribe in his pedigree, Carlton has the genetics to get the job done. He will not be available for sale until we have used him extensively across our herd, but we are including him in our herd sire lineup so if you are looking for exemplary conformation and fiber characteristics - and who isn't? - bring your girl by and treat yourself to an incredible cria. Scarlet is a gorgeous maroon Cantano daughter who has thrown awesome offspring (see my foundation listing for Carmella!). She was rebred to MoJo, who throws awesome offspring of his own, so I expected her 2017 cria to be stunning, and I was not disappointed. 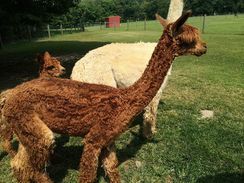 On July 22, she delivered an awesome red female cria. Scarlet has a lovely fleece, with high luster and consistent lock. Her color is awesome – none of my photos have really picked up the depth of color and the maroon cast. I can send a fiber sample if you wish. MoJo is the most awesome macho in terms of superior conformation, fertility, proven production capability, and temperament. His fiber is a luscious medium rose grey, and his white neck is a partial expression of traditional tuxedo grey. He has a large patch of silver grey on the back of his neck. This male is one of my favorite PR boys, and he loves greeting people at the county fair or at festivals. He stands quietly for injections, shearing and other health procedures. Mo has exceptional motility and has been known to impregnate multiple females in less than an hour (much to his dismay). 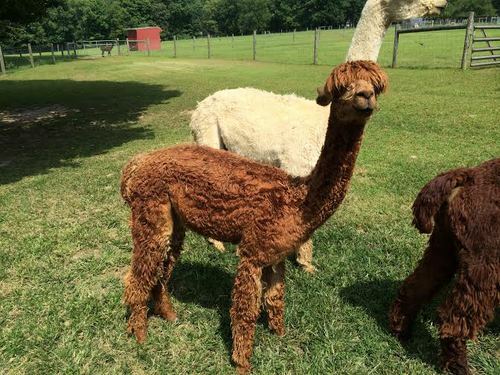 This is a good sign that his daughters will inherit his fertility since there is a close genetic relationship between the fertility of male alpacas and their daughters. Carmella is an absolutely stunning yearling female out of the Jackpot and Uribe lines and is a Cantano granddaughter. She has exceptional luster and lock, beautiful conformation and a sweet spirit. This gal will make a wonderful production female. I plan to breed her next year to MoJo, whose lock and luster are a perfect match. Breeding successful. Pregnancy confirmed by sonogram 3/11/19. Financing is available on purchases of $1000 or greater. I may also consider accepting end products for resale as all or part of the purchase price. Contact me to discuss what you have to offer.